The title of this posting takes off from the quotation “Toto, I’ve a feeling we’re not in Kansas anymore” (with the negative polarity item anymore), from the movie The Wizard of Oz, but uses positive anymore (anymore in a positive context, roughly conveying ‘now, nowadays’). Roadside attractions. Earlier on this blog, the posting “Big roadside attractions” of 4/21/12, with the Kaskaskia Dragon in Vandalia IN, the World’s Largest Catsup Bottle in Collinsville IL, the Giant L&P Bottle in Paeroa NZ, and two big things of Australia: the Big Pineapple in Woombye near Nambour QLD (cf. the US Big Pineapple in Baltimore MD) and the Big Penguin in Penguin township TAS. Strataca, also known as Kansas Underground Salt Museum, is located in Hutchinson, Kansas, United States. It is built within one of the world’s largest deposits of rock salt and provides the opportunity to go 650 feet (198 meters) beneath the Earth’s surface. It is a unique destination attraction for exploring an environs carved from salt deposits formed 275 million years ago. 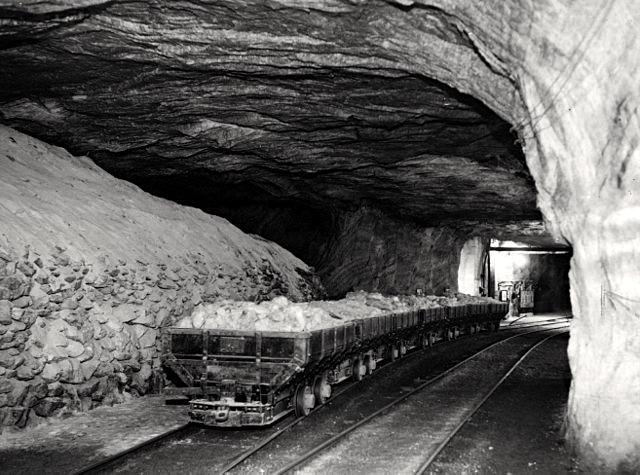 The museum is located in the Hutchinson Salt Company mine which began operation in 1923 as Carey Salt Company. A severe change in terrain comes when you descend the Rocky Mountains into central Colorado. After days of hairpin turns and two lane roads caught behind gasping Winnebago’s, the Great Plains suddenly stretch before you in a never-ending flatness. No longer confined to travel along pioneer passes and river cuts, you can go in any direction you want. Invariably, plains towns have the urge to raise their arms, and jump up and down, yelling, “Over Here!” We commend this, and when they yell, we’ll aim our car towards the hubbub, whether it’s the Wonder Tower in Genoa, Colorado, or the World’s Largest Twine Ball in Cawker City, Kansas. 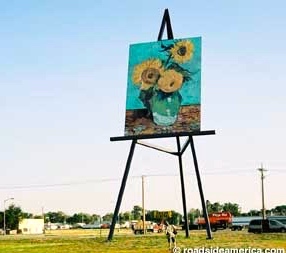 For the past several years, Goodland, in western Kansas, has been waving at passers-by with the World’s Largest Easel (or at least the largest along a U.S. Interstate). It’s 80 feet tall, and atop it rests a 32×24-foot representation of one of Van Gogh’s “Sunflower” paintings. It’s about a half-mile off of I-70, along Hwy 24 near the center of town. When exactly did the citizens of Cawker City bug out on their big ball? We’re not sure. But one thing is certain — what started as one man’s convenient storage of scrap twine has mutated into a community project, binding together the whole town. 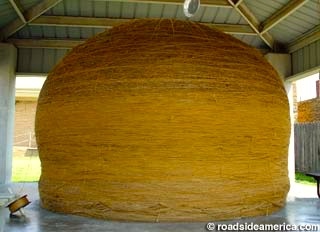 The World’s Largest Ball of Twine endures as a paragon of strange U.S. tourist attractions. Uttering the phrase instantly conveys core roadside values — the mind-boggling achievement, the one-track obsession, the over-the-top silliness. For us, visiting a Twine Ball is a pilgrimage. “The Tee Pee” is a relic from an earlier time, when Indians were evidently giants who built their homes to last. The main teepee building design was actually patented by its creator, Frank W. McDonald, in 1930, so the structure likely went up in the late 1920s, well ahead of later Wigwam Villages. 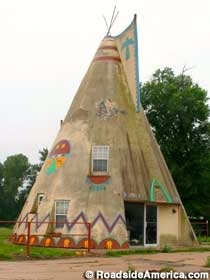 It’s 50-feet tall, 33-ft. in diameter, and was the centerpiece of a US 40 roadside complex “Indian Village” that included a gas station, restaurant and motor court of smaller teepee cabins. Pizza Hut is an American restaurant chain and international franchise, known for pizza and side dishes, it is now corporately known as Pizza Hut, Inc. and is a subsidiary of Yum! Brands, Inc., the world’s largest restaurant company. … Pizza Hut was founded in 1958 by two Wichita State University students, Frank and Dan Carney, as a single location in Wichita, Kansas. The oldest continuously operating Pizza Hut in the world is in Manhattan, Kansas, in a shopping and tavern district known as Aggieville near Kansas State University. The first Pizza Hut restaurant east of the Mississippi was opened in Athens, Ohio in 1966 by Lawrence Berberick and Gary Meyers. When the pizza craze started sweeping the nation in the late 1950s, two young college students, attending [what was] the University of Wichita at the time [Wichita State since 1964], opened the first Pizza Hut restaurant on June 15, 1958. Brothers Frank and Dan Carney had been approached by the owner of a small building at the corner of Kellogg and Bluff, who wanted a nice neighborhood business to locate there and she had read a November 1957 Saturday Evening Post article about the pizza craze. The building’s structure influenced the name of what would become a well-known international chain. The building had a sign that would only accommodate nine characters. The brothers wanted to use “Pizza” in the name and that left room for only three more letters. A family member suggested that the building looked like a hut — and Pizza Hut was born. 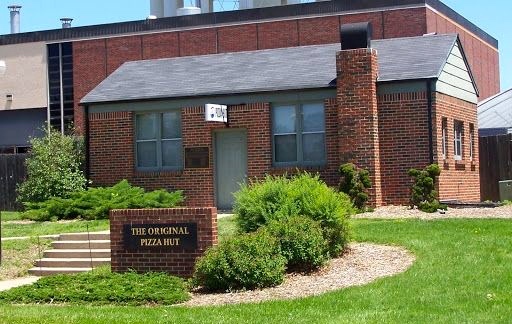 The first Pizza Hut building was moved to the WSU campus to serve as a symbol and reminder to WSU students that young individuals through hard work and initiative can rise from modest beginnings to positions of leadership and success. It was dedicated on campus September 11, 1986. The building originally served as a headquarters for WSU’s Association of Collegiate Entrepreneurs. This entry was posted on January 28, 2015 at 4:53 am and is filed under Language and food, Linguistics in the comics, Pop culture, Semantics, Silliness. You can follow any responses to this entry through the RSS 2.0 feed. You can leave a response, or trackback from your own site.